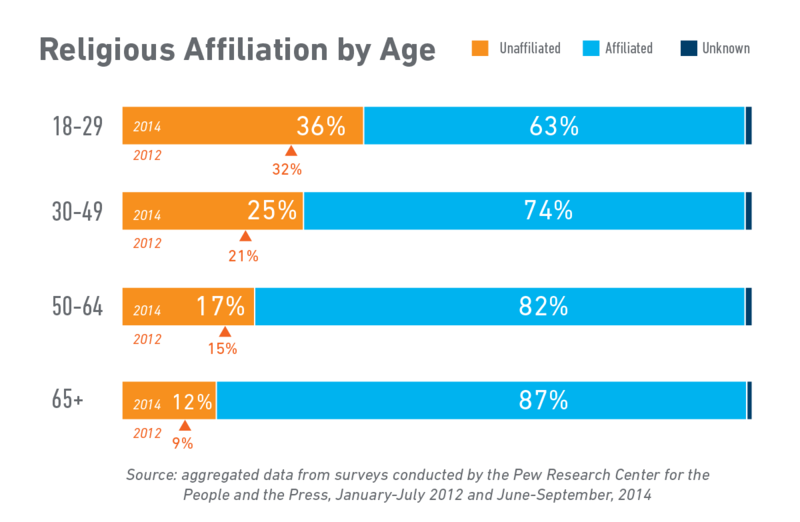 The most recent Pew Research data clearly shows the number of religiously unaffiliated Americans—referred to as “nones” since they claim no religion—is growing with each passing generation. In his book, “God’s Not Dead: Evidence for God in an Age of Uncertainty”, Rice Brooks reveals that, “the term new atheists has been given to a group of skeptics who have sought to revive the arguments against God and repackage them for a new generation.” Not only are adults increasingly claiming no religion, but their children are following suit as well—and at younger ages. Our youth have found their voices, and they aren’t afraid to use them. Young people do not hesitate to make their thoughts known on social media or put them on a t-shirt and wear it with pride. Our ABY data infers that the “atheism trending younger” tendency is not just a Western “thing”, but rather that it’s a global phenomenon. So what is turning off each successive generation to belief in God, church and religious tradition? Some complain that organized religion is too suffocating, hypocritical, judgmental, or anti-gay. Others don’t want to enter into the complicated mess that is religion and politics. Allegations of fiscal infidelity and abuse within the church aren’t helping either. But are any of these really the root cause of what has made it so attractive and trendy for each successive generation to move away from rich, religious traditions? What can we do to help the next generation return to faith? Research shows that the most influential factor in a child’s life is family, followed closely by church and religious texts like the Bible. That throws responsibility to parents and church leaders—who might be stepping in as spiritual parents for kids who don’t have family who are believers. A recent Fuller study analyzes why high school graduates seemed to walk away from their faith after leaving youth group. What they found were gaps where family and church were failing to intentionally talk to youth about next phases of life (like college, a career, new job) and inadequately preparing them to step into these next phases with their faith strapped on tight. Going a step beyond what research tells us, I would say the most important thing we as parents, church leaders and influencers can do is to instill a sense of destiny into our children and youth. Parents, pastors and Christian leaders need to give each and every boy and girl in their circle of influence a vision of where they fit into God’s big story; how they are each a part of something bigger than themselves with a clear path and defined meaning for their lives. To help drive the idea of spiritual destiny home and give kids the ability to dialogue with “family”, we develop programs that not only introduce children and teens to Bible stories, but to a Big Story. Some of our most important partnering is done through the local church where discipleship and mentoring programs ensure that spiritual parents are in place for every child. The family voice is powerful. We need to be sure kids hear it.